I bought this bike brand new in 2007. I installed a scorpion exhaust, and still have yet to put the k&n air filter in. This bike completely blew me away. I have riden ducatis and mv agustas tons of bikes, but for an easily affordable sport bike, this was the one. Insurance is awesome compared to a full fairing bike. If it&apos;s dropped you won&apos;t have to spend $3000 on just fairings to fix it. If you need new side fairings for this bike you can get them for under $200. This bike will pull its front wheel off the ground. Great mid sized bike that&apos;s not too small but not too big either. This bike performs awesome on back windy roads at higher speeds rather than the big bikes that take a lot more effort to get around those corners. 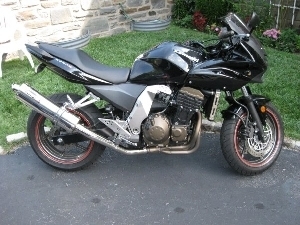 I have had no problems with this bike whatsoever, no leaks, but the dash and fairing excessively vibrate when you hit about 70mph but that is very common for the z750s&apos; fairing design. I highly reccommend this bike to anyone. The 2006 is great b/c it was the last of the old body styling that was sold in America, now you can only purchase the new ones in Europe with the newer features and styling.